As well as creating invoices and credits that for opportunities and projects, sometimes you might need to create a blank invoice. These are manual invoices and credits in Current RMS. Create a manual invoice straight from an opportunity or project – it will be linked to the opportunity or project so you can view it from the respective page. Need to create a one-off invoice? Create invoices and credits not linked to a project or opportunity in any way. Manual invoices and credits act the same as other invoices and credits, so you can take all the same actions such as posting to a linked accounting solution or voiding. Why use manual invoices and credits? Sold something or dome some work outside of Current RMS? Create a manual invoice and add a text item to it, then print your invoice paperwork to keep on-brand. Need to charge for damages or spares? 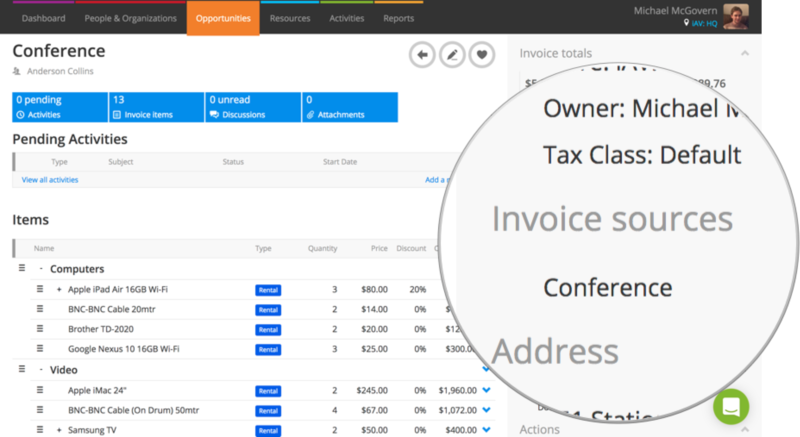 Create a manual invoice and add on those items. Head to Opportunities > Invoices & Credits and use the green add invoice and add credit buttons. The invoice or credit won’t be linked to an opportunity or project. 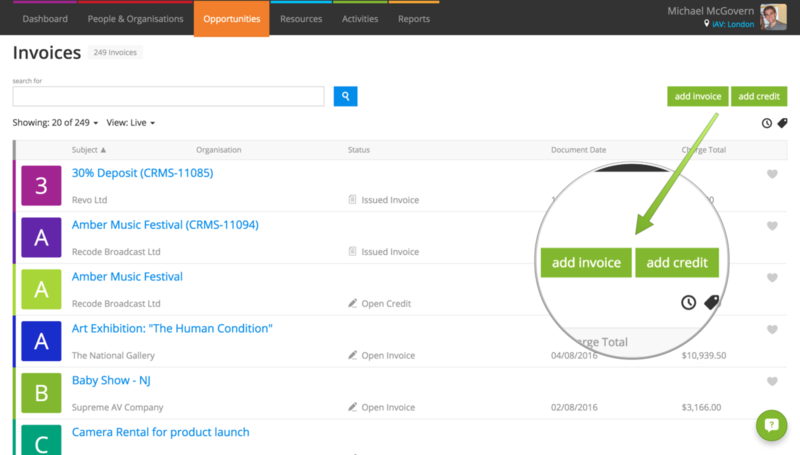 To create a manual invoice from an opportunity or project, hit the add a new manual invoice link under the Invoices section. Any invoice items you add to the manual invoice will automatically be linked to the opportunity or project, so you’ll see the invoice listed on the opportunity or project page alongside other invoices generated. The subject is the title of the invoice or credit. This appears on any document layouts you print or download and you can use it to search. This is required. Great for searching and sorting, describe the invoice or credit with tags here. Hit enter to turn tags blue and lock them in. Who is the invoice for? Start typing an organization and Current will auto-suggest from your People & Organizations. Create a new organization on the fly by hitting the green plus icon to the right of the organization box. The customer reference field corresponds to “Your Reference” on most document layouts. It’s usually used for a purchase order number. If the organization you selected has multiple addresses, choose the billing address here. This may impact tax calculation settings. Choose a different organization tax class, if required. The date the invoice or credit was entered. It defaults to the date and time now, but you can change it if you need to. When is the invoice due? Set the date here. Description is for internal notes. You’ll see this at the top of the invoice page. It’s a space to record notes for your team. External description is for your customer. Add any customer notes and these will pull through to most of the customer-facing document layouts. Use the drop-down box to choose a delivery address that you’ve recorded against this organization. Go ahead and type in an address into the delivery address fields. Start typing in the “Venue” box to choose from one of the venues you’ve added to your People & Organizations. Click or tap on the green plus icon to the right of the venue box to create a new venue in your People & Organizations, handy if you’ll be delivering to this venue again in future. Stores are a way of setting up multiple locations with different stock levels. The store defaults to the store you are working in right now, but you can change it here if you would like reports to reflect the invoice or credit is for another store. The owner is the person who is responsible for the invoice or credit. This is automatically set to the user account that created the invoice or credit. When you’re done, hit the blue Create button. You can start adding items straight away by clicking add a new invoice item at the bottom-right of the items list. Invoices and credits are linked to opportunities by invoice items. To create a link between a manual invoice or credit and an opportunity, enter the name of it in the “Opportunity” box when creating a new invoice item. Once created, you’ll see the opportunity listed in the “Invoice Sources” section on the right-hand side of the opportunity. You’ll also find the invoice listed on the opportunity page under the “Invoices & Credits” heading on the left.